Culinary Trends - Lightly Smoked Tasmanian Ocean Trout "Mi Cuit"
Filet Tasmanian ocean trout and remove all bones but keep skin on; it’s easier to handle in the smoker with skin on. Place in cold smoker and smoke over applewood chips for at least 30 minutes. Remove filets from smoker and then remove skin and any fat on skin side of filet. Spread a piece of plastic wrap out on cutting board and wrap filets together to form a tight tube; this should take several layers of plastic. It should look like a long sausage at this stage. Place the wrapped ocean trout in the refrigerator until ready to use. Cook Yukon gold potato in salted boiling water until cooked but still very firm. The potato is cooked when a metal skewer can penetrate potato with a little resistance. The potato needs to be firm and not too soft. Drain the potato and when it’s cold enough to handle, peel and cut it into a julienne using a Japanese mandolin with the middle-sized teeth. Place the julienne potato into a bowl, and mix to taste with the sea salt and fresh ground black pepper. Heat four blini pans over medium heat and place a tablespoon of grapeseed oil in each pan. Divide potato mixture into each pan and pack down the potatoes until a nice rössti cake forms; cook until a golden crust forms. Turn the potato rössti over and cook until this side also has a golden brown crust. Remove the rössti from the pan and place on a plate lined with a paper towel and keep warm. Cut pancetta into small pieces and place in a small saucepan over medium heat; render the fat from the pancetta. Drain pancetta onto a plate lined with paper towel and then add 1/4 cup of grapeseed oil to the pan along with the chopped shallots. Lower the heat and sweat the shallots until they are translucent. Shallots will pick up some of the color left behind form the pancetta, but they should not caramelize during this process. Next add sherry vinegar, honey and vegetable stock. Bring to a boil and then turn down and allow the flavors to come together. This should take about 5 minutes. Add the pancetta back to the vinaigrette and season to taste with sea salt and fresh ground black pepper. Set aside. Preheat the oven to 150ºF and add a pan of hot water to the oven to create some humidity or light steam. Portion ocean trout into 2 ounce-sized portions by cutting directly across the tube of trout. It is key to leave the trout wrapped with plastic as this will help hold the shape and keep the trout perfectly round. Season the trout with salt and place into the oven for 18 to 20 minutes. The trout will cook at this temperature, but it will still have that same raw appearance. While trout is cooking, place a medium-sized saucepot on stove and fill it with water to poach the eggs. When water comes to a boil, add a cup of white wine vinegar to the water and drop in the chicken eggs, one at a time. Turn down the heat and cook until the whites are firm but the yolk is still runny. Remove from water and season with fresh ground pepper and some fleur de sel. To plate dish, divide the crème fraîche evenly among four plates. Top the crème fraîche with a warm potato rössti. In a small bowl, toss the watercress with some of the pancetta vinaigrette and divide among the four plates placing it on top of the potato rössti. Remove Tasmanian ocean trout from the oven and remove the plastic wrap. 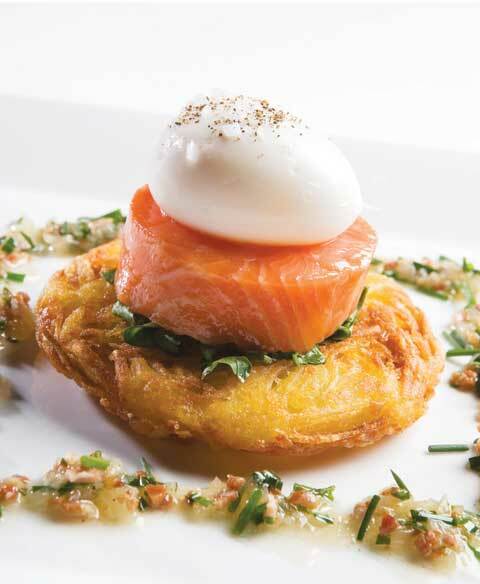 Place the trout on top of watercress and then the poached egg on top of the trout. Finally, heat pancetta vinaigrette and finish it with the chopped tarragon and chives and spoon this around the plate. Serve.